Obviously Microsoft’s Edge browser is the new default choice in Windows 10, and it’s definitely worth giving it a try. I’ve found it to be speedy and surprisingly good. Persevere long enough and you might grow to like it as I have. That said, if you prefer to use Chrome or Firefox, with all the add-ons and customizations in place, I really couldn’t blame you. Edge isn’t (yet) as flexible, and if you already use Google or Mozilla’s browser for syncing content between devices, then it makes sense to use the same browser in Windows 10. Here’s how to setup a rival browser as the default option. Firstly, when you install a different browser, you will likely be prompted to make it the default (you can set the browser to always perform this check when starting up). Do so and you’re good to go. The first time you run Firefox or Chrome on a recently updated Windows 10 system you'll probably be given the choice to make it your default. This doesn’t always happen though, or you might accidentally skip past this step. Fortunately, there’s another, and possibly better way of setting the default browser. 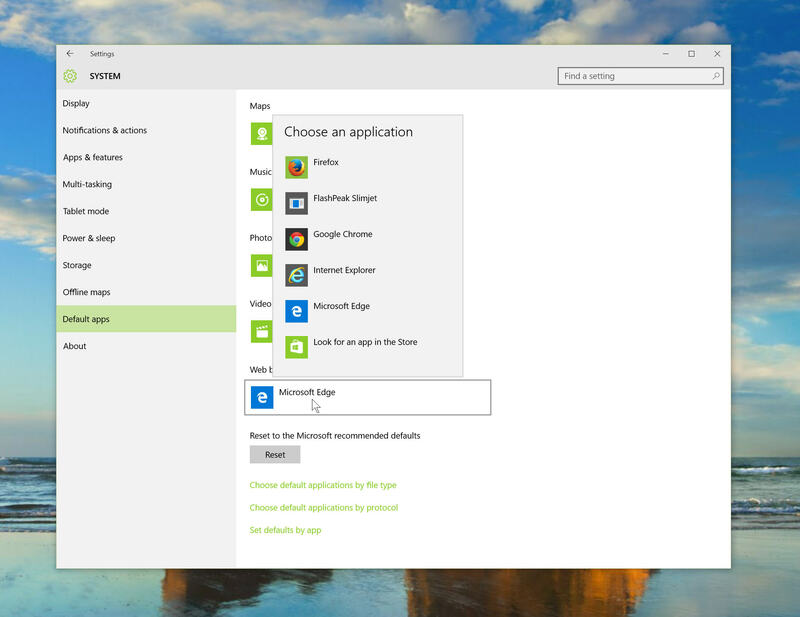 Open the Start menu and type 'default app settings'. Hit enter. Click on Web Browser (which will be Microsoft Edge by default) and select the browser you want to use instead. You can also set the default browser through the Control Panel. Open the Start menu, type 'Default programs', hit enter and click 'Set your default programs' in the window that appears. Click your browser in the list on the left and then click 'Set this program default' on the right. You can also choose which file types and protocols that browser opens by default.